You are currently browsing the tag archive for the ‘Pagansim’ tag. The first thing I have to say is…thank you God, Goddess and every deity known to human kind and the few known to monkeys for helping me get through Exam Week. I know this will sound whiney, but I feel like I’ve been dropped kicked across Milwaukee, all the way to Madison and back. I kid you not, when I came home from my last exam of the semester, I went to my room and slept for three hours before my mom came home around six-ish. Essays, essays and guess what…more essays! Luckily one was a take home, but doing that and trying to study for four other classes is NOT an easy task. I can’t believe I only have one more semester until I have my Bachelor’s…very scarey. I’ll be posting a second part to my Saint Expedite spell post early this coming week, because I …sort of…forget to do it because of exams (thank you wonderful Emmelia for reminding me! 🙂 ). It’s just going to be a brief go through of what I did with the ritual ‘remains’ of the spell and maybe give you guys some ideas if you want to do this spell. First…sleep. Blissful, wonderful, much needed sleep. 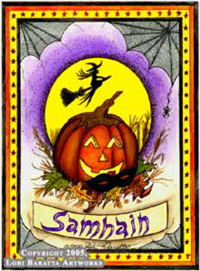 What is Samhain you ask? You probably know it better as Halloween or All-hallows-eve. Every year on October 31 (or May 1, if you’re in the Southern Hemisphere) the Pagan Sabbat called Samhain gives people the opportunity to celebrate the cycle of death and rebirth. For many Pagan and Wiccan traditions, Samhain is a time to reconnect with our ancestors, and honor those who have died, similar to Dias de Los Muertos. It is also considered the Witches New Year because according to the Celtic calendar, Sunset on Samhain is the beginning of the Celtic New Year. “This is a good time for us to look at wrapping up the old and preparing for the new in our lives. Once you’ve gotten all that unfinished stuff cleared away, and out of your life, then you can begin looking towards the next year” (Patti Wigington). One of the things me and my family like to do is create an ancestral alter with images of our loved ones who have passed and decorate it with leaves, gourds, some food like homemade bread as an offering and 1 lit black candle to honor the dead. We also sometimes have a big bonfire outside, but this year we might not since there’s been so much rain lately, and I’m going to try to create a besom! But the best thing we do is take a road trip to the cemetery and visit my mom’s relatives. It feels surreal when you go to a cemetery on Samhain. I would describe it as a weighty feeling on your chest and a warm prickly feeling on your skin. Every time we leave after leaving offerings on the graves, I have a head ach that won’t go away until we get home. But then a sense of peace washes over and the pain is forgotten. I don’t know why that happens but I’m okay with it. This year’s Samhain is…going to be rough because I’ve finally gotten up the strength to put up my Mush-Mush’s picture up on my alter this year. It’s an old Polaroid of her smoking a cigarette and wearing my favorite shirt she had: a tank top with all of the classic movie monsters on it like The Mummy, Dracula, Frankenstein and others. It’s almost been two years but every time I look at it I can’t help but get misty eyed. I know I haven’t been posting anything really pertaining to writing or Wicca lately but right now that is going to change as for now. Today I want to put something to rest that a lot of pagan newbies worry a lot about. Me: “We’re doing our ritual, shhh”. Me (glaring): “No, shut up. And it’s a wand, not a stick”.